You toward unparalleled allure and might. May magma stir your blood and gadflies never bite. Editor’s Note: This homage to the Galilean moon, Io, is written as a Spenserian stanza (https://en.wikipedia.org/wiki/Spenserian_stanza). 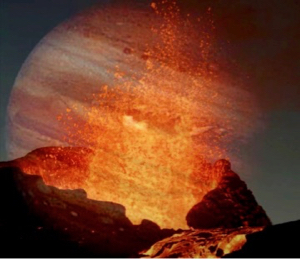 The accompanying image is a superposition of an active volcano and Jupiter as viewed from Io (with some artistic license), both from Pinterest. Io is the most volcanically active body in our solar system.